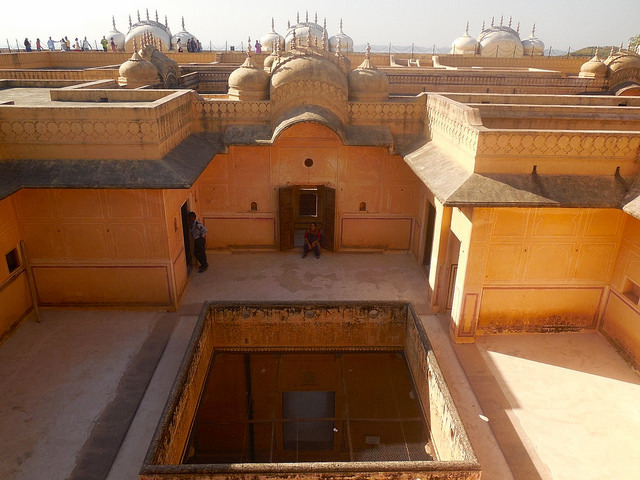 Golden Triangle - Bharatpur, Jaipur - Ghumakkar - Inspiring travel experiences. Second leg of the trip was dedicated to Bharatpur and Jaipur. 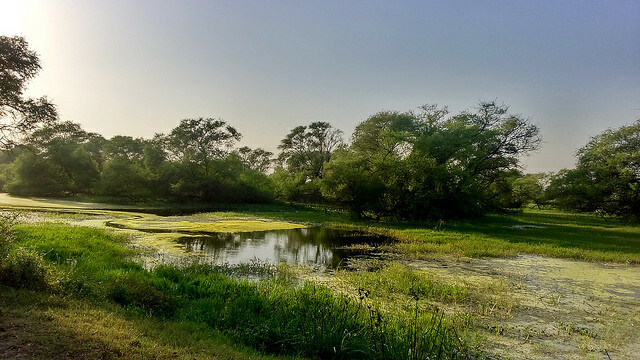 From Fatehpur Sikri we drove to Bharatpur and went upto Keoladeo bird sanctuary but there was no decent restaurant or dhaba visible. The govt restaurant would have taken some time to service so we skipped it. We eventually went to a private restaurant and had sumptuous lunch. 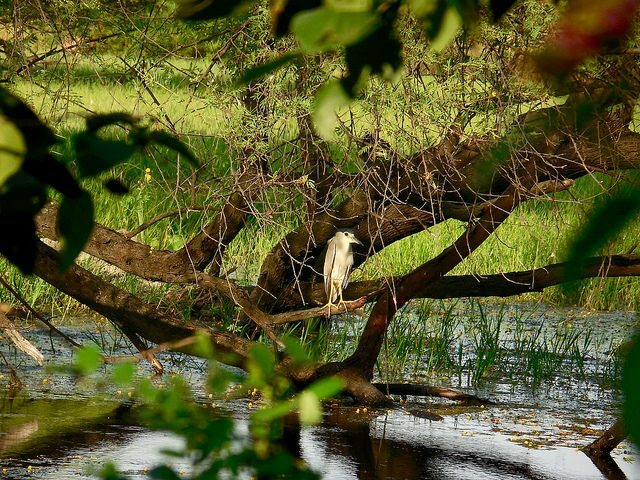 It was 3:00 PM and we had three hours to visit Keoladeo Sanctuary before it closes. Vehicles are not allowed inside and there are rickshaws available for hire or one could walk or take bicycle. We hired three rickshaws and started off. There is a small museum dedicated to birds which was ordinary. The rickshaw guys took us to a temple inside which has a small attached lake which has giant tortoise who like to eat atta balls. 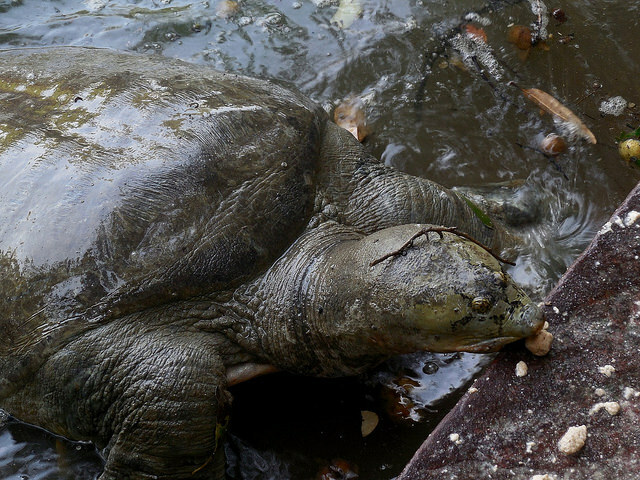 It was nice attraction for kids to see long-neck of tortoise protruding out of its shell to eat the atta balls. This was a little early in the season for birds to be abundant but still there were some. 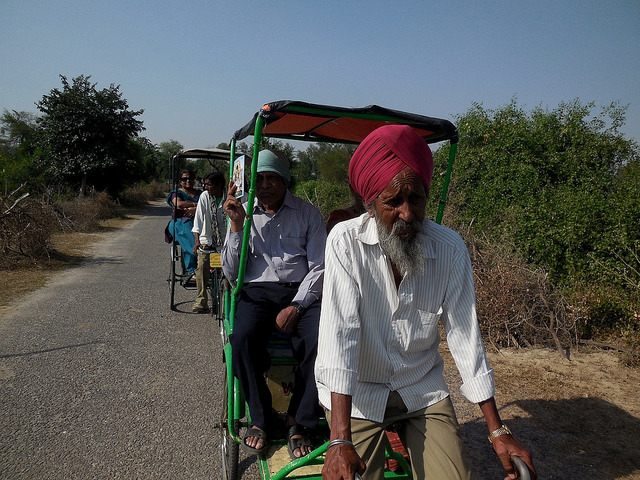 The rickshaw pullers also double up as guides and were showing us different birds like Cormorant, Heron, Stork etc. The park has just single road with trails shooting off to right, left. 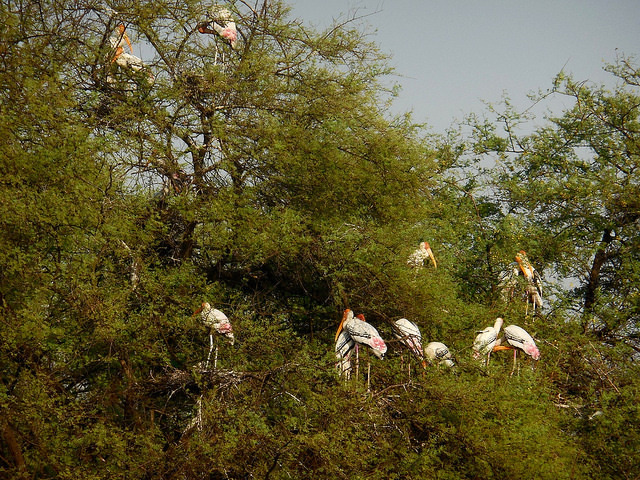 Near some marshy area there was a huge group of painted stork. We started from park at 6:15 pm and fortunately the ride to Jaipur was swift without any obstacle. There was huge tunnel while entering Jaipur and using navigation we were at the hotel by 9:30 pm. We were booked at Fort Hathroi which is a heritage property again through OYO rooms. Its funny that I booked OYO rooms through Cleartrip and got huge discount by them. The rooms were big and had internal door for adjacent rooms which was convenient for us.I was not equipped with good camera or binoculars so I just admired from a distance. We ventured a little on foot inside the walkable paths and had some nice, quite time. We came out at 6:00 pm and had tea and snacks just outside the park. Again like earlier attractions I made it a point to come back here in leisure and watch the birds for the entire day. Let’s see when that happens. Next morning we were slated to do city tour using RTDC bus which had to be boarded from their office at MI Road which was just couple of kms from hotel. We were late to leave the hotel but the bus had still not come at the venue. Once it came, there was lot of confusion about the number of buses, seats etc. and it ate away lot of precious time. We eventually got seats in the front of the bus. The bus then went around picking up people from RTDC hotels. Anyways, once everyone settled we began the tour. Our guide was an interesting character to be seen apart from the attractions. He wore a listening device in ear, kohl in eyes, safari suit with a hat and broken english. 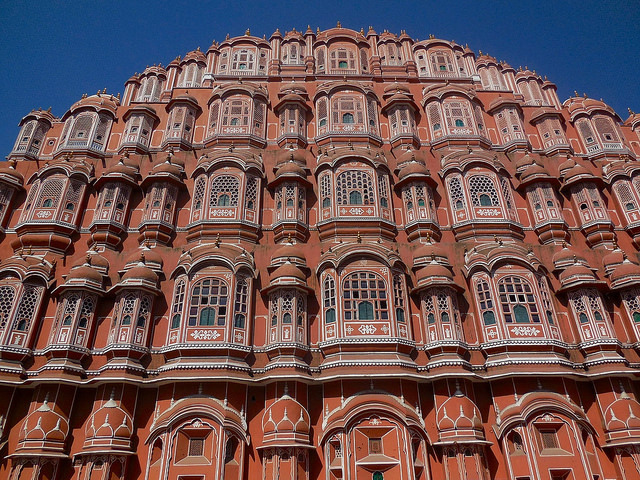 We visited Hawa Mahal but did not stop, then Jantar Mantar, City Palace and then a handicraft store. 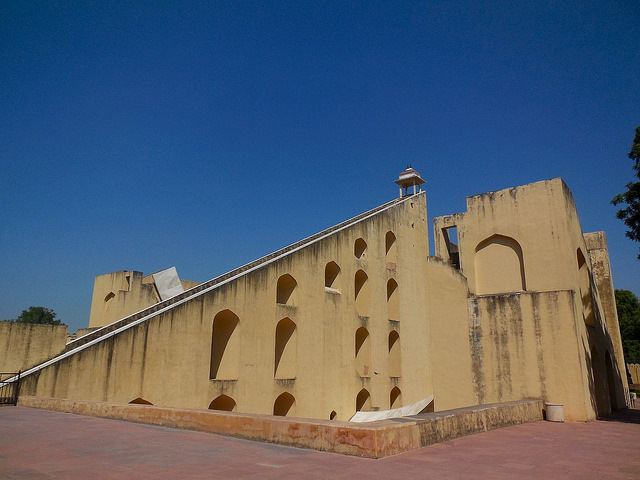 Jantar Mantar was very well maintained. Our guide was taking the group and telling them about all the instruments. The sundial here is the one of the biggest. 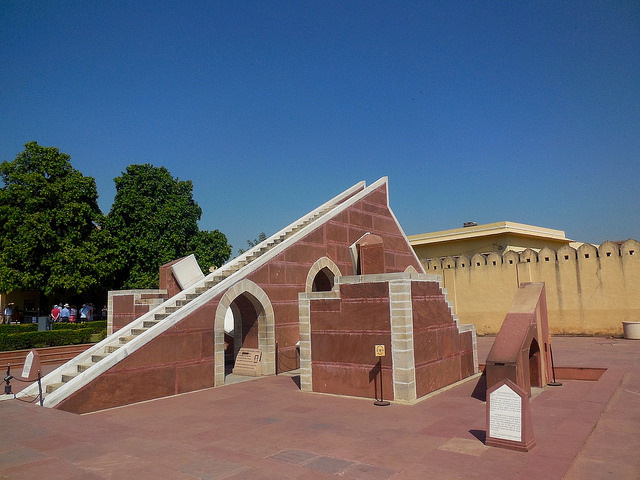 Though there are many complex instruments but the easiest ones for tourists to understand are the current local time which was accurate on the instrument. Since it was getting hot we hurried through the instruments and went into shade. There was a lovely small temple with a tree beside it with squirrels running around. 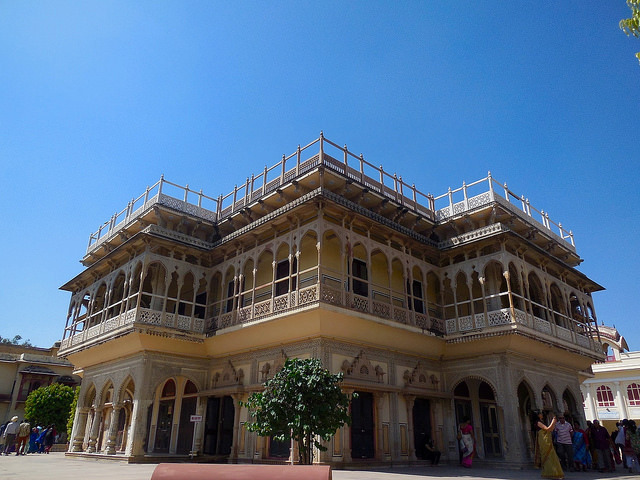 City palace was an epitome of opulence. The building, the carvings, the chandeliers, a round of guns, huge utensils etc. were sight to behold. The building itself was painted very nicely and everything was impressive. 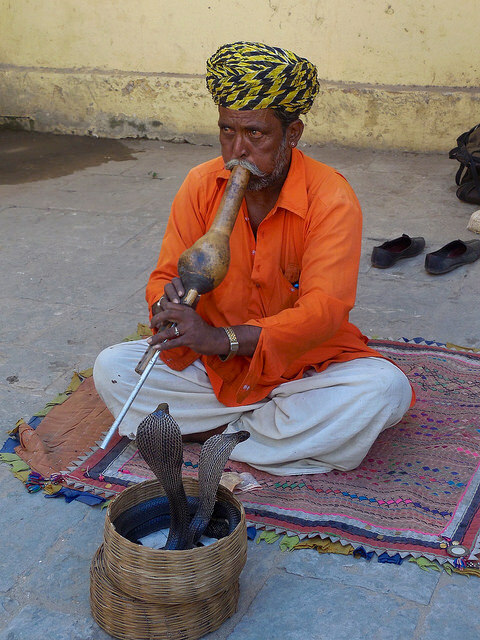 Just outside the exit, there was a snake charmer playing his been. He was attracting lot of attention as the tradition is almost extinct. After handicraft emporium we were slated to go to Nahargarh fort. It was getting a bit hot and due to long weekend there was lot of tourist traffic on the way to Nahargarh fort. The bus dropped us well before the gate as it cannot enter the narrow entrance and we had to walk almost a kilometer inside. Once there everyone went to the only restaurant there but it was overwhelmed by the number of people who were ordering food. The kitchen was barely able to fulfil the orders. And after patience runs out chaos ensues. The crowd was just all vying to get their order picked up first. Along with me standing was a foreigner who was dumb-founded by this unruly behaviour. He too had bought a thali and but was unable to get it. I helped him to get his order and he was thankful. I was disappointed by crowd who showed their worst in such situation when even foreigners are present. After lunch there was very little time left to visit the fort but we still took a round of it going over the floors, windows, roof. 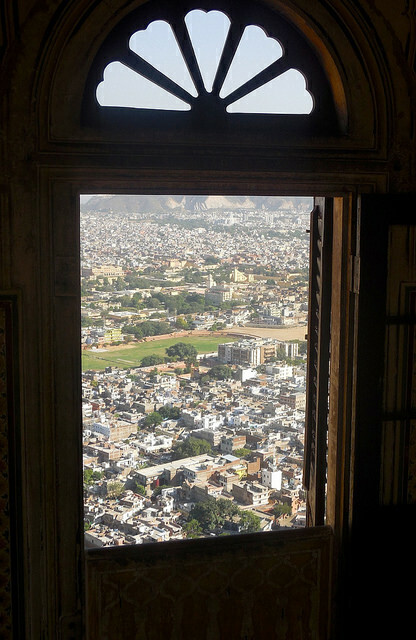 The whole Jaipur city was visible from top. To get to our bus, we took an auto to get to the gate where bus was waiting. Due to paucity of time our guide cancelled going to Jaigarh fort by giving a laughable excuse. This is all mismanagement by RTDC wasting precious time in picking up everyone then taking us to shopping in the middle of the day and not stopping for food at some proper restaurant. 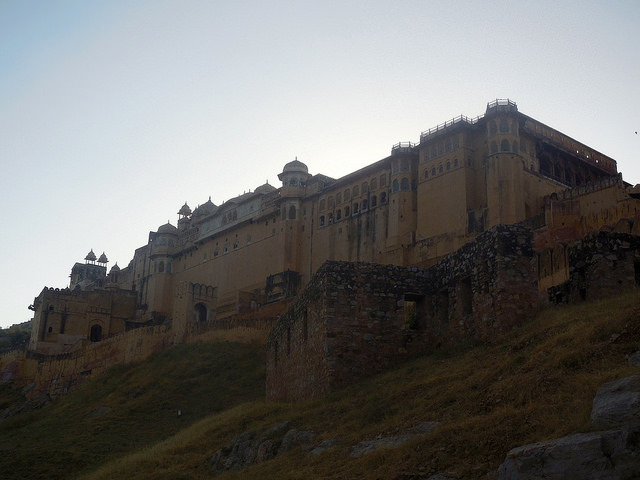 Next destination was Amber fort which involved some climbing up the stairs and walking around. With day’s travel we thought to let rest of the family at Kanak Vrindavan garden and while me & wife visited the fort. We hired a guide again who took us around. There was supposed to be a ticket bought beyond a point but we did not go inside. It was quite crowded at evening time. 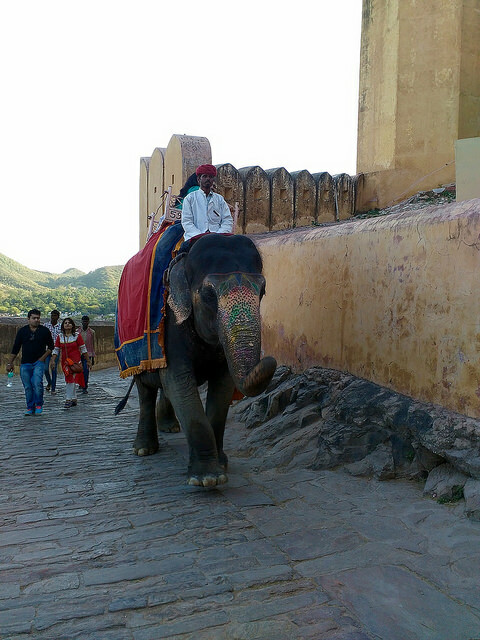 Here there are elephants available to climb upto main fort entrance in grand style. After finishing off our tour of Amer fort we came to Kanak Vrindavan garden and were glad that family rested well and kids enjoyed playing. We too rested for some time. After that we thought of ditching the tour bus as it was going to take more time to get back to our destination. We hired a tempo auto who was apprehensive to take so many people as it was beyond limit but eventually agreed. We managed to fill in with me sitting in the boot space. The driver was smart and took us through internal roads to avoid all the traffic on the main road and in reasonable time we reached the RTDC office. We picked up our vehicle and came back to hotel. Today we were supposed to go to a Dhani outside Jaipur where we were invited by an office acquaintance who owned the place. Once we reached there, the kids enjoyed several rounds of Camel ride while we sipped the buttermilk. Out in the open, it was getting cold already. 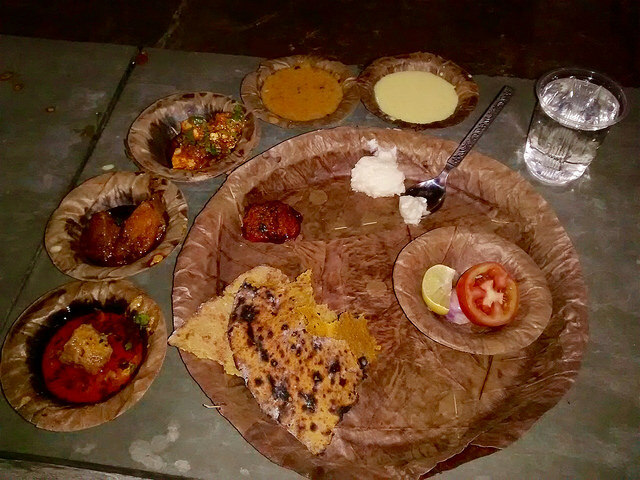 We had a delicious traditional Rajasthani food and it was out of the world. The taste was distinct than anything we eat in cities. After that we came back to hotel and rested. Next day we were slated to come back to Delhi. Our flight from Delhi was at 6:40 PM so were supposed to reach by 5:00 at the airport. The plan was to drive straight to airport. In the morning I drove a little in the city to tank up and found the roads and infrastructure pretty good and there was even a Metro there all functioning! I was lamenting how Pune being a bigger city with crying need of a metro the work hasn’t even started. We did a leisurely drive back to Delhi. Since I was coming to Jaipur-Delhi highway after long time, I was looking for what all has changed especially around Gurgaon. There were many more buildings and much more crowd. For lunch we stopped at 32nd milestone. I was coming here after around 14 years and had nostalgic feeling. After that I thought of visiting past my first employer’s building in Udyog Vihar phase-II. Nothing had changed here and the building and surroundings were still like what it was in 2001. After leisurely drive we finally reached airport where our driver had come to take back the rest of the family home. This completed a circuitous route without wasting time getting into Delhi and again coming back to airport. I patted my back for the meticulous planning. Our flight was nice with good service. At Pune, we stay close to airport so it was a convenient trip back home. Thinker, dreamer, traveler, photographer, rail enthusiast, activist. Also a software professional. Great post. It seems to be one of the whirlwind trip. this blog is amazing, a lot of information is given by the blog. people if you want to know more about the India, you must visit http://www.indianssouls.com. this blog you get all the information about all topic of india. Great post, good Grammer. 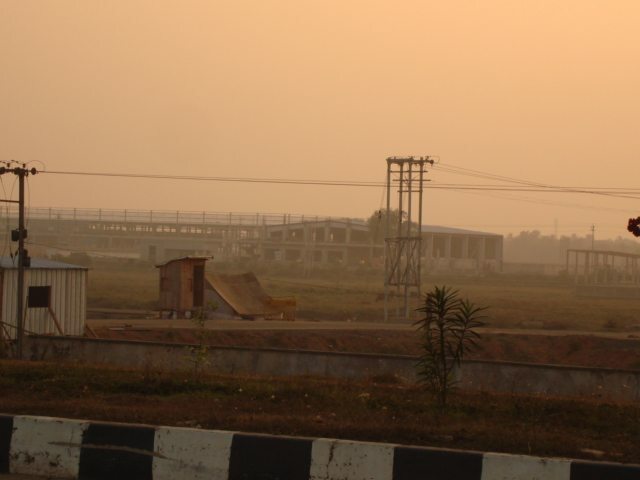 The best part of the journey is the drive on the Durgapur Expressway (NH2) from Kolkata to Tarapith and Shantiniketan. In Kolkata this road is well known as Dilli Road. This highway is one of the best in the country.